Made this card for a man celebrating his 70th birthday, but it would probably be appropriate for anyone young or old. I'm pleased with how it came out. This was cut from the Wrap It Up cartridge at 6-1/2" and the label from Lacy Labels at 3" fit to length. The sentiment is from Fiskars Make a Wish Quotes. Inside is stamped with Happy Birthday. Embellished the chocolate cardstock with Divine Swirls and added some yellow ribbon from my stash. I'm entering this into the Birthday Sundaes Challenge #5-Anything Goes Birthday Card. ﻿ TFL! Great card! 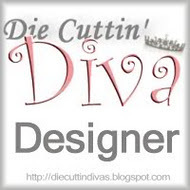 I am a fan of your designs and look forward to what is in store for me next! I just love this cut. I am not crazy about Wrap it Up, but after seeing your card I need to explore more. Thanks! great job. love the swirls on the chocolate paper. yummy! This cake shaped card turned just great. Yummy! Great embossing and perfect sentiment! This is SO adorable! I love the stripes on those candles :) Great work on the details here.